I can't even begin to properly express how excited I am to write this book review. If you could see me (and NO, I won't post a video) I'm doing a little jig as I type this up. I FINALLY get to brag about my friend and fellow knitter and yarnie, Heather and her NEW BOOK! I met Heather almost 2 years ago on a yarn crawl in sunny San Diego. What you need to know about Heather is that she's tall... like almost 6' tall (I check in at a whopping 5'-3"). And blond (though she'd say she's a red head...). And stunning! So meeting her was a total movie star moment. I felt like I could hardly get the right words out. But, as it turns out, the nerves were all for naught. She was down to earth, totally approachable and, well, she gave me a free pattern. Plus! She liked my necklace. I liked her yarn. We both love beer. A week later we were out eating pizza, drinking beers, and becoming fast friends. Knitting love at first sight is real, folks! As I got to know Heather, who, by the way, is also the owner of Ewe Ewe Yarns, it became clear that she's not only a terrific knitter and fabulous friend, but she's an advocate for learning and designing projects accessible to knitters of all skill levels. Enter Heather's new book: Scarves In the Round, 25 Knitted Infinity Scarves, Neck Warmers, Cowls and Double-Warm Tube Scarves. The book is a soft cover, full color and, if you're maniacal like me and want books to lay flat when you knit... guess what? This one does! It's not a coil-bound but the binding is soft so you can open the book without creasing it and the pages don't flip. I LOVE that! This book starts out with Beautiful & Basic cowls (*cough cough* you miiiiiiight find me on page 3... oh yeah... that's the first pattern in the book, baby!) in a myriad of colors, textures and weights. I'm slightly partial to the Super Simple Cowl featuring Outer by Spud & Chloe, a super bulky yarn, primarily because a) I LOVE that color (it's color 7209, Cedar) and b) it's ME! So, it's kind of hard NOT to love it. And speaking of this Super Simple Cowl, there's a Super Simple Giveaway that I'll be detailing at the end of this blog post. But trust me - you'll want to enter it because the prize kind of rocks - there's a gift from Heather herself AND from Spud & Chloe. Can I get a "what what" for all that generosity?! Large needles and large yarn, such as you'll find in Adorned, which features Sister Yarn and Rolling Stone from Knit Collage take a simple concept and turn it into something breathtaking. It's just knits and purls but it's absolutely gorgeous! The next chapter, Lovely Lace, takes the knitting up a notch - the work becomes lighter, softer, more all-season as you could wear these in the summer and the winter. Check out this beauty that is taking Ravelry by storm: The Seaside Lace Capelet! My second favorite section in the book: Cables, Twists and Bobbins. Why my favorite? 'Cuz I'm a sucker for cables. They look so tricky and yet when you get the hang of it, you can rock out a cable and impress everyone around you. The first cowl in this section, the High Speed Cable Cowl uses a super bulky yarn again, Franca by Manos del Uruguay, and could be rocked out in a day. And the scale? Absolutely perfect! And how about the Double Agent Wrap? It's large enough that you can dobule it up and wear it as a cowl, or rock a belt and you have an absolutely adorable vest? Ummm... yeah... this is on my list to make like, NOW! 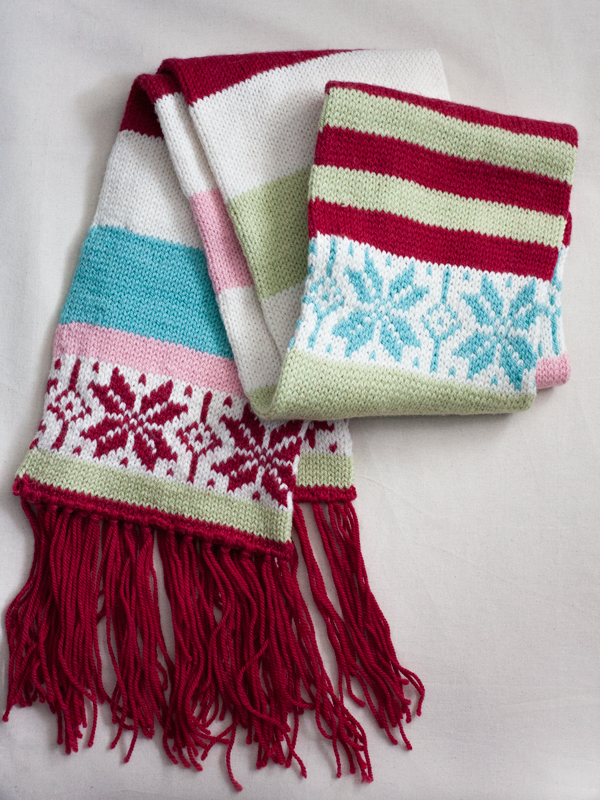 And I think, my absolute favorite in the entire book, not just this section, is the Snow Drifter Scarf. For serious - how chic would you look wearing this next winter? Sadly I didn't get to knit this one but I did get to see it as it grew (Heather conveniently lives just up the road from me) and I loved it at every stage. And if we lived somewhere a bit colder I'd probably steal it and claim I didn't know what happened to it. After all of these glorious patterns... there's still more to be had. The back of the book is a plethora of "How To's" that show how to work each of the stitches in the book. There's even a section on how to block your projects. Where was THAT when I started knitting?! I'd say, all round, this book is a blast. And not just because I'm in it, and not just because Heather is a friend. There are projects in this book for everyone, and I can't wait to knit my own. Some of them for a second time since I don't get to keep the samples I made... like, what's up with THAT?! 2 skeins of "Cedar" in Outer from Spud and Chloe so you can make the cowl that I'm wearing in the book. ... made out to YOU directly from Heather. Like... with YOUR name in it. Whaaaaaa?! 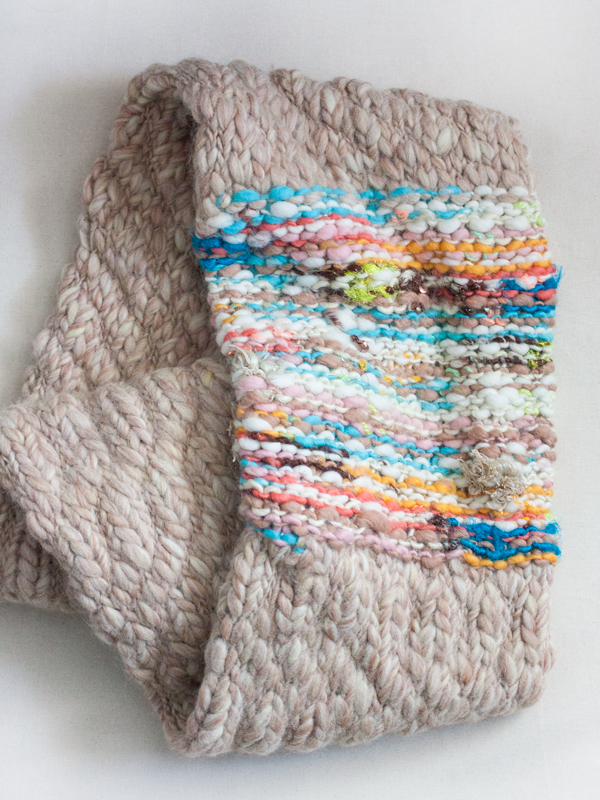 ... go visit the Scarves In the Round page on Ravelry BY CLICKING HERE. Then post a photo of your favorite project on Instagram or Twitter using #scarvesintheround; feel free to tag me, @socalmeaghan, and Heather, @eweeweyarns, too. If you don't have accounts, since I know not all knitters are social media fiends, leave a comment here on the blog telling me which project is your favorite and why. The prize entries close at 11:59 PST on Thursday, June 11th, 2015. A winner will be chosen randomly on Friday, June 12th. I will contact you directly and get your mailing address so I can ship the prizes out to you. Not too shabby, eh? I hope you've had fun taking a tour of Heather's book with me. If you don't win, you can get your own copy from Stackpole Books or if you've got Amazon Prime you can get it shipped free. Either way, get it, love it, knit it all. I promise you won't be disappointed.